The church steeple, higgledy-piggledy roofs. The golden onion of the Russian tomb in the cemetery, which sits above the Old Town of Menton as it always does in French towns. The dead have the best view. Le clocher de l'église, le fouillis des toits et l'oignon d'or du tombeau Russe dans le cimetière qui se trouve au-dessus de la vieille ville de Menton comme c'est toujours le cas dans les villes françaises. Les morts ont la meilleure vue. It's funny that you said the dead have the best view from the Cemetery. I've often said the same thing! You took a long climb to get this shot but the result was well worth it. We remember this place. The variety of the roof features makes this photo. Brilliant. 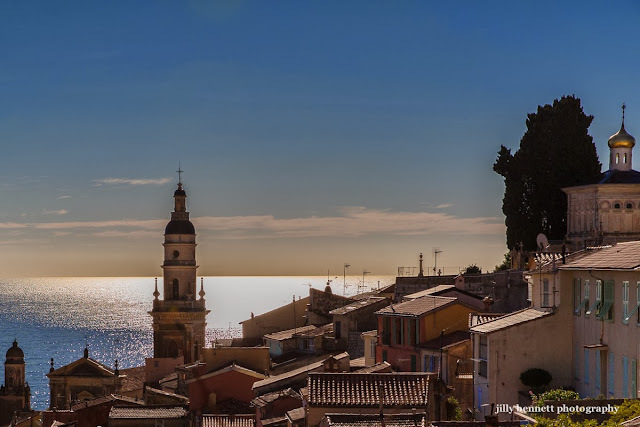 Typical view of Menton rooftops, one that you can never tire of.